In honor of Women’s History Month in March, I would like to write about an unsung hero of her day and someone who made a tremendous contribution, which is still seen today. 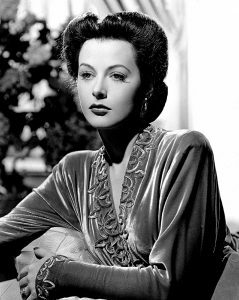 Actress Hedy Lamarr was arguably one of the most beautiful women of her time. Although not an engineer, Lamarr made significant contributions to the field. With a mind for mathematics, Hedy supposedly learned about military technology during a dinner with Nazi generals that she and her then husband—who was an arms manufacturer—attended. This dinner took place just prior to her escaping to the United States, where she eventually made her contribution—a new torpedo guidance system—known to the U.S. Navy. Not limited to a single invention, Lamarr designed an instant fizzing soda cube and a tissue box attachment for trash. She was the consummate tinkerer, not particularly interested hosting parties like others of her status. Inventing was her hobby, which led her to dedicate an entire room of her house just for her inventions. Although she was not taken seriously by many at the time, her passion for inventing led to a patent for a “frequency hopping” breakthrough still utilized by civilian and military organizations alike. Her most recognized work came from co-inventing a frequency-hopping wireless signal for guiding U.S. Navy torpedoes to their targets. But even after Hedy enlisted the help of fellow inventor George Antheil and received a “Secret Communications System” patent in 1942, the U.S. Navy ignored the breakthrough until its engineers rediscovered the patent in the mid-1950s. More than likely, Lamarr’s motivations for frequency hopping came from the parties she attended with her then husband Fritz Mandal who, as an arms dealer, likely introduced her to numerous German officers in the years leading up to World War 2. After leaving her husband and coming to the USA to begin her acting career, Lamarr became outspoken regarding her distaste for the reports coming in about German submarines torpedoing ships—particularly those non-military ships. At the time, she attempted to go to Washington D.C. to testify before a committee about her knowledge of German technology, but the meeting never took place. Fortunately for history, Lamarr partnered with Antheil who helped her to develop her idea for frequency hopping, also known as spread spectrum, which involves wireless radio signals switching quickly between several different frequency channels so that the signals could not be jammed. While the U.S. Navy never took advantage of this technology during World War 2, they eventually applied the technology to “jam proof” their radios during the Cuban missile crisis. This technology has had far-reaching implications being utilized even today in GPS, Bluetooth, and even guided missiles. Hedy Lamarr was not an engineer, but her contributions to our field are undeniable. I encourage our readers to write about other female pioneers in the industry—engineers or not—to pass along their accomplishments and keep this history alive. Please send your contributions to Jane at Jboler@exemplarglobal.org.